"This is a recipe for ghee, or clarified butter, used in many Indian dishes. It is difficult to find in small-town America! It will keep in the refrigerator for a few months." Melt butter in a large skillet over low heat until butter starts to foam and boil, about 10 minutes. Push the foam to the side, without stirring, to see if butter is clear, bright, and golden. Remove skillet from heat and add salt; cool for about 2 minutes. Pour butter through a fine-mesh strainer or cheesecloth to remove foam and particles into a glass container. Ghee will thicken and turn slightly translucent. Store in refrigerator. See how to make flavored butter using beautiful, edible flower petals. If butter turns brown or black, you've burned it and you have to start over. It doesn't get any easier than this. 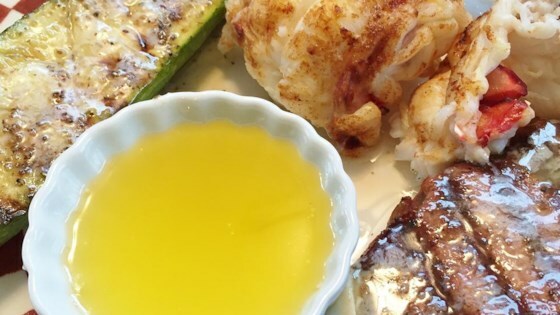 Just add some black pepper and lemon juice to make perfect dipping butter for lobster or shrimp. Just what I needed! I used a fine soup strainer and it worked perfectly. I also find it work best to heat in a saucepan, not a skillet. So easy and super delicious. We live at the beach and this is just as good as any local restaurant. Perfect for our Alaskan crab leg, shrimp, broccoli & hush-puppies we're having tonight. I made this and it was very easy. Patience is key and keep the heat low! I strained it through a fine mesh sieve lined with cheese cloth and still had some solids on top.